Banana Muffins are a muffin version of this Banana Bread. They start with a thick sweet batter that is full of mashed bananas, ground cinnamon, and toasted nuts. Banana Muffins are a snap to make. Just mix the dry ingredients together in one bowl, and the wet ingredients in another bowl. Combine the two and you are done. When you pull the banana muffins from the oven their golden brown crusts are delightfully crisp, and although their crusts soften once covered and stored, their wonderful moist texture and sweet flavor remain intact. The good thing about these muffins is that they can be made anytime of the year as bananas are always available with consistent quality. The important thing to remember is that some preplanning needs to be done. This recipe uses bananas that have turned brown with age which are hard to find in most grocery stores. Bananas are most often sold when their skins are still bright yellow, sometimes even a little green, which indicates that the flesh is still quite hard with little flavor. This may be great for eating raw but not for making muffins when you want the bananas to be soft and sweet. So just let the bananas sit at room temperature for a few days or until their skins have lots of brown spots. For those times when you don't want to wait several days for the bananas to ripen you may want to have some brown bananas already frozen in your freezer. All you need to do for this is to place very ripe bananas in a plastic bag either whole or you can peel and mash them, stir in 1 teaspoon lemon juice for each banana, and then freeze in an airtight container or bag. Note: Bananas originated in Southeast Asia and are one of the best known fruits in the world. Although there are hundreds of varieties most of us only know the dessert kind which have a high sugar content, and with their sweet taste, are usually eaten raw. Bananas are long and curved and grow in bunches (9-12). They are picked unripe when their skin is still green. As they ripen their skin turns yellow which can be easily peeled off to reveal a cream colored soft flesh. Originally called "Apple of Paradise" or "Adam's Fig". 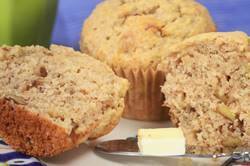 Banana Muffins: Preheat your oven to 350 degrees F (180 degrees C) and place the oven rack in the middle of the oven. Line a 12 cup muffin pan with paper liners or butter or spray the muffins cups with a non stick spray. Place the nuts on a baking sheet and bake for about 8 to 10 minutes or until lightly toasted and fragrant. Let cool and then chop coarsely. In a large bowl combine the flour, sugar, baking powder, baking soda, salt, cinnamon, and chopped nuts. In a medium-sized bowl, combine the eggs, melted butter, mashed bananas, and vanilla extract. With a rubber spatula or wooden spoon, lightly fold the wet ingredients (banana mixture) into the dry ingredients just until combined and the batter is thick and chunky. (The important thing is not to over mix the batter. You do not want it smooth. Over mixing the batter will yield tough, rubbery muffins.) Evenly spoon the batter into the prepared muffin tins. Bake about 20 - 25 minutes or until a toothpick inserted into the center of a muffin comes out clean. Place on a wire rack to cool for five minutes and then remove muffins from pan. Serve warm or at room temperature.